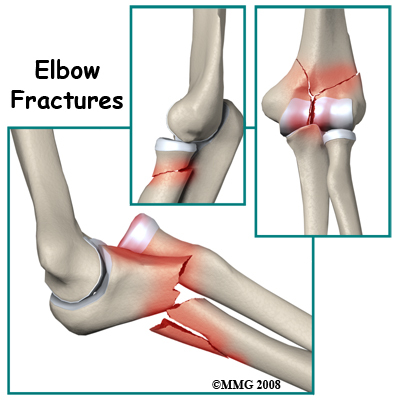 An elbow fracture is a break involving any of the three arm bones that work together to form the elbow joint. Such fractures may occur as the result of a blunt force striking the elbow during athletics or from a fall on the elbow. The injury is common to many sports, particularly contact sports such as football. Fractures may be classified as distal humeral, radial fractures, and ulnar fractures. Fractures of the radial head are the most common. The elbow is a hinge joint that is comprised of three bones, the upper arm bone or humerus, and the two bones of the forearm, the ulna and the radius. Of the forearm bones, the ulna is the most medial, being on the little finger side, and also the largest. At the distal end of the humerus, are the trochlea and the capitulum, which form part of the elbow joint with the radius and ulna. The annular ligament binds the head of the radius to the ulna, forming the proximal radio-ulnar joint. Falling directly onto the elbow. Direct trauma to the elbow. Severe torsion of the elbow beyond its normal range of motion. Swelling and pain in the region of the elbow. Deformity of the elbow due to bone fracture. Loss of arm mobility. Without treatment, fractured bones of the elbow can fail to heal properly, and at times, fuse in misalignment. This can lead to long-term deficit in arm motion and strength, increased vulnerability to re-injury, and deformity of the joint. Elbow fractures occur from sudden, accidental trauma and are often difficult to prevent. Avoiding athletics at periods of extreme fatigue and protection of the elbow with padding during athletics are both prudent. Additionally, consuming calcium and performing bone strengthening exercises may help avoid fractures. Long-term prospects for elbow fractures vary depending on the nature and severity of the fracture as well as the age and medical history of the injured person. Infections, stiffening of the elbow joint, arthritis, non-union or malunion of bone are possible. In the case of less severe elbow fractures, full recovery may be expected, though the healing process often requires several months. Call (+65) 6471 2674 (24 Hour) to check your elbow fracture today.